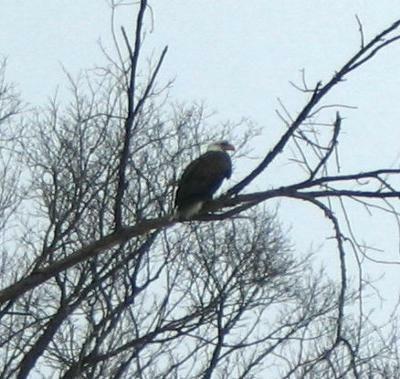 One of our readers sends us this report of her Bald Eagle sighting - February 18, 2010. While driving along Prince of Wales Rd., just north of Primrose, Ontario, my husband suddenly stopped the car right in the middle of the road and pointing upward said "Look!". We saw a magnificant Bald Eagle sitting on the top of a tree. As we watched, the Eagle took flight and landed on the top of another tree, and at that same time a gentleman in a pick up truck also stopped in the middle of the road and was watching this wonderful animal with us. How lovely for you to see this rare animal - thanks for the picture too! Comments for Bald Eagle sighting north of Primrose, Ontario. This must have been really amazing to see.